So what was going on with Ronald Jones last year? Answers came via his scant playing time and heinous production. But there are more. The No. 38 overall pick, still just 21 years old, was brought up by America’s Quarterback, Jameis Winston last week. Talking to Michael Vick for a FOX Sports interview, Jameis was asked about the Bucs running game. Usually, Jameis is all fired up about his offensive teammates. But Jameis called Peyton Barber a “good” running back, a “true three-down back for us (Jameis typically uses the adjectives “amazing” or “great” for teammates). And then he brought up the disappointing rookie. “We got a young back, Ronald Jones. He’s steppin’ up. Last year, his first year, he’s just trying to get acclimated to things,” Jameis said. Ok. “Just trying to get acclimated.” Ouch. Running back is know to be the easiest college-to-pro adjustment of all the NFL positions outside of kicker and punter. Just think of how many Bucs rookies have had outstanding games as rookie RBs, including three in the post-Chucky era: LeGarrette Blount, Doug Martin and Mike James. 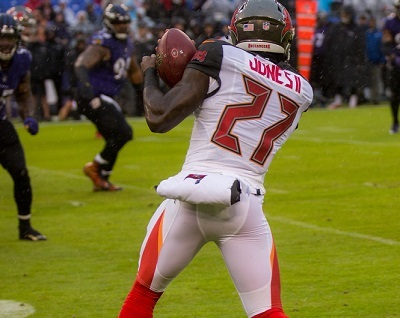 The Bucs surely won’t give up on Jones until they see him with pads on. But Joe suspects Jones could be launched by September 1 if he is still struggling to look like the guy he was in college. Such a small sample size to base it off of. With that being said, as bad as we were last year, he still couldn’t get any reps. That has to mean something right? Side note: is there a chance at all Rock Ya-Sin falls to the second round? I’m withholding judgment on nearly everyone from the last couple years until they’ve been truly evaluated and coached up by a REAL coaching staff for once. Then we’ll actually see what we’re really dealing with. “Acclimated” means adjusting to being an adult that now has to earn his keep in a league littered with great athletes. Jones was a terrible pick in the 2nd round. He cant catch, can’t pass block, and didn’t play special teams….yet seems to think he’s destined for being elite. When you really dive into what Licht gave Koetter to work with, it was a constant series of babysitting/growing pains with no depth to promote competition. To be fair he was constantly hit at or before the line of scriamge constantly. I don’t know of any “scatt” back would have succeed in that situation, let’s just see how he does behind a better line and more confidence. Please someone sew JW mouth shut. He is a complete idiot. Hey Jameis eat more W’s because they will make you smarter. Like Martin two years ago, the number of touches where Jines was not first touched by a D player less than one yard behind the LoS is tiny. The ground game problems are poor line play and unimaginative play calling. Koetter was creative through the air but less than pedestrian in the running game. I loved Dirk Koetter, but he was pass-first all of the way. He claimed to want to run the ball, but both he and Monken abandoned it in 15 of 16 games pretty quickly. So Rojo got very few game reps…which means, yes, he is slower to acclimate. I don’t see why people have given up on him already. I get that he hasn’t shown much, but he also hasn’t been given the reps to do so. I personally never viewed him as a starting RB. I viewed him as an eventual replacement for Sims. The ‘Klueless Koetter’ moniker won’t hold water when his offense stomps us next year. I have to agree with your take. However, I also believe the talent to fix the offensive line is currently on the team (or due to be free agents soon). Not everyone has given up on ROJO…yet anyway. All will be forgiven and a dismal rookie season will be forgotten by all if he transforms into a pro version off the RB he was in college. Count me as cautiously optimistic, but it’s certainly a leap of faith right now. Tom stfu, hes trying to give the kid a compliment and not knock his confidence. Troll harder dude. WRONG, WRONG, WRONG!!! Two words: Doug Martin’s fault! OK, 3 words! I don’t need to wait because there wasn’t one. That’s a HUGE red flag. Keep in mind Barber ran behind the same line and Rojo’s supposed to be “faster and shiftier”. Improving the line will certainly help but premiere RBs shouldn’t need craters to run through on every play. The Oline for the past 3 years was never taught to run block. They were only descent at pass blocking. Although I don’t have much faith in Rojo, to be fair, he was consistently hit in the backfield. Would like to see him run with a revamp right side of the Oline. Does getting acclimated mean: “Running with a football in your hand”? And if so, WHY DID WE DRAFT THIS GUY?!?!? if we draft an RB(d.herderson or d.singletary) the writing will be on the wall for jones….i could see the bucs pulling a kenny bell and putting him on IR if he doesnt flash…..
Buccaneer Bonzai – Koetter’s offense isn’t going to be stomping us next season. He is clueless and his mother wears army boots. bucinsyracuse says: Side note: is there a chance at all Rock Ya-Sin falls to the second round? him and lonnie johnson from kentucky looked real good in the senior bowl but 2nd round is a little too high to draft another CB….they are both 2nd round picks all day and the combine and pro day could push them into the 1st…..imo, we have to go trenches first 3rounds…. In the limited carries I’ve seen, and without watching anything but college highlights, Jones really reminds me a lot of former Bandits and Bucs RB Gary Anderson, in that he is sort of really smooth and “flowy” until he has an opening, at which case he sort of bursts forward. Jones doesn’t seem to have a lot of stop and go ability, in that he lacks that instant acceleration from stop. Also Jones doesn’t appear to be a power back so just asking him to run up the gut on every play isn’t very productive either since the blocking is poor, there is no hole, and he’s trying to stop and go but isn’t built for that. 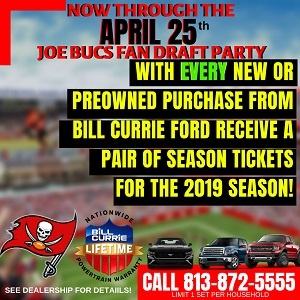 Anyways while I didn’t like the pick at all and thought it was really stupid to waste your top 2nd rounder on a RB when you had Ryan Smith and Chris Conte starting for your defense, still, he was a fairly highly thought of RB even if it certainly appeared on draft day the Bucs reached to get him. This last year should be thrown out and he should get a totally new and fresh look and hopefully the coaches don’t put him in a fail situation like Dirk did. If you’re going to draft a guy like this, who seems to do best running left and right and then exploding forward, then you need to play to his strength. Now with all that said my scouting could be totally off since it is, again, based off watching him with the Bucs and perhaps they used him so poorly that it’s impossible to know anything about him from that limited sample size. Also I’ll say the kid did have some quality runs in the preseason and regular season and I believe that every single one of them was called back on a penalty, so if you’re looking for plays where he showed anything, you need to look at plays where there was a flag thrown. ROJO couldn’t catch an STD while rolling through Stormy Daniel’s house party with her hoochies!! That in and of itself is a major reason why we have to move on from Mr. Brick Mits. No idea why Licht chose ROJO over all the other RB options last year, none! And he’s a little too lean in stature still. In today’s NFL, you have to be able to routinely pickup the blitz in pass pro, and must, MUST catch the ball seamlessly at all times, without needing to nervously look around the corner for the defenseman coming before the ball arrives. Love Josh Jacobs size, stature, and talents, Perfect for today’s NFL!! If the Bucs could stumble on him lower in the 1st round perhaps, I could certainly live with that while picking up more picks. Keep an eye on Vaughn out of Vandi, that’s a grown a$$ man right there for whom I believe makes a smooth transition to the NFL. The stat 47 yards after contact being more than his total rushing yards tells me all I need to know. Ke’shawn Vaughn played Baylor in the Texas Bowl and had almost250 yards n 13 carries. Has anyone stopped to consider that several 2019 Draft eligible JR RB’s are OLDER than or born within 6mths of RoJo???? NFL RB’s peak season are usually ages 23-27…Meaning we should expect to see RoJo 2.0 make big jumps in performance over the course of his rookie contract. Humm… I didn’t see that on the field at all, he never seemed to be able to accelerate once he stopped. Other than that everything else in the scouting report says what I saw, which is that, to me, he looks like more of a east/west runner that can accelerate once he’s moving. If he’s used this way, if he’s not just pounded up the middle on 1st and 10 when everyone knows it’s a run, I’ll be interested to see what he can do. He’s asked a question and Tom doesn’t want him giving any answer at all. To make fans like Tom more happy…maybe Jameis could just say no comment. or Tom can still just be Tom and Jameis be Jameis. If I had to be either one I think I’d rather be Jameis than Tom. Tom doesn’t sound too bright. Jones was asked to do none of what made him successful as a collegiate athlete. Koetter wanted a third down back that could pick up the blitz and catch out of the back field. Also wanted a back to hit the edge, even tho they weren’t effective sealing it. He’s a classic one cut back who did the most damage between the tackles. I have seen scouting reports on him critical that he didn’t bounce plays to the outside, yet this is how the Bucs wanted him to run. I hope he can be fixed. At 3.2 mil dead cap space this season, its unlikely he will be cut. While I see giving him a chance I remain doubtful. RB is the one position where guys come into the league and can perform from day one…and I’m the optimist of the group…doesn’t look good for ROJO. He’s very young so who knows. Maybe he grows up this season or as JW says gets acclimated. Hopefully he’s had a very productive off season in the weight room with some special “growth” medicine…can you say ‘roids. Would much prefer to sew YOUR mouth shut. So shut the F up. keep Rojo but do not expect anything–tuck him away in the back of the closet and see if the Arians regime can make any sense out of him later in ota and camp. On another note we need a back like CJ Anderson–a big boy that can hurt to tackle. I think we look toward the veterans(or bottom of the draft)and save the draft picks for Defense. Mostly fix the damn line, sign Donovan Smith and let BA “work” with him when he takes a mental vacay. Use Liedtke or Wester for Right Tackle, retire Dot with a part time coaching position. Mostly get a damn good guard and jettison Beneneoch–do not keep even for backup. Dump overpaid Evan Smith, develop Cappa. Glad to hear BA has singled out O-Line for improvement–just wait–he has not even begun to sound off yet. Along with the big back sign Kareem Hunt. And for God’s sake sell DJax to anybody for anything. I said it during training camp last year. After reading his “training camp” diary on another site, it was painfully obvious that he is not very smart. His writing was atrocious. It is an embarrassment and an indictment of USC. That HAS to translate to his everyday life as well as his ability to retain information. It’s easy when you are in college and better than everyone else. Not so easy when you are playing with NFL caliber players. The offensive line did not do a good job in the run offense so how was any running back supposed to have a good year? I’m not even close to giving up on this kid. Fix the real problem, that offensive line. Give this kid a little space and he’ll make something out of it. If his problem is learning the new playbook then sign him to the PS until he’s ready but giving up on a player after his rookie season is silly talk. He’ll be an Orlando Apollo by this time next year. They went after a back who had speed and it didn’t work out. Get the ball, run to the hole. Other than blocking, running back is easy. He is not going to make it. Actually, there was one. But only one. Early when he started playing. He blew it at first, but then was given another chance. And then came a play where he broke free and turned on the speed. However, in all fairness, he never really had a chance to play regularly. You cannot expect him to play well if he is not playing often enough. Mind you, I am not saying he;ll be great. I don’t know. And that is the point. No one really does. It;s a 50-50 guess at this point. Although, the best way to learn a play book is to put it into practice. To run the plays. New playbook this year too. I am not impressed with all the things being said about Bruce Arians (yet), but one thing I do like is how he will run the practices. As to the rest? I have to point out that his issue learning to playbook are all rumors and speculation. And he only averaged 1.5 attempts per game (9 games) this past season. No running back is going to do well with so few plays. Ronald Jones had more yards-after-comtact than he had total rushing yards… The kid has skills, if he’ll just settle in and perform like he can. Thought it was interesting to see Michael Fabiano list Rojo as the 134th best fantasy player next year. Look at the RBs listed after!!! Think our WRs and TEs are any good? ?